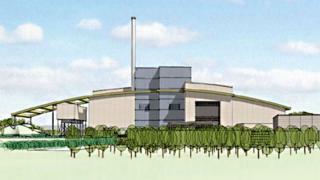 Work has started on a £275m energy-from-waste incinerator in Buckinghamshire. The facility at Calvert, near Aylesbury, is expected to convert 300,000 tonnes of non-recyclable waste a year, the council said. Objectors said the facility was not needed in the county. The plant is due to be finished by March 2016. It is expected to convert enough energy to power up to 36,000 homes. The project, run by FCC Environment, will divert household and commercial waste from landfill. Buckinghamshire County Council (BCC) said it was expected to save council tax payers more than £150m over the life of the 30-year contract.